Congressional sources say that GOP lawmakers and strategists are urging Speaker Boehner to kill any gun control legislation that comes to the House by refusing to act on it. The Speaker is planning “what could be a months-long review of the bill that likely would involve chipping away at gun-related measures” and instead encourage options that focus on the mental health aspect of gun violence. 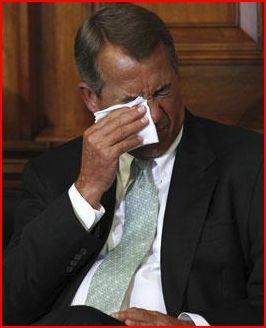 “I fully expect that the House will act on (gun) legislation in the coming months,” Boehner said. “But … I want the (House) Judiciary Committee to take the time to look at whatever the Senate does produce – assuming they produce something – and have members on both sides review that and make their determination.” Read more at: Breitbart.com. This entry was posted in 2nd Amendment, Constitution, Legislative Branch, States' Rights, Unalienable Rights and tagged 2nd Amendment, Bloomberg, Cuomo, Gun Grab, Newtown, Right to bear arms, Right to Keep and Bear Arms, Sandy Hook, Second Amendment. Bookmark the permalink.